Lately, I’ve been seeing a lot of red peppers at the markets, and I couldn’t be happier! You see, I usually make a big batch of this roasted red pepper sauce at the end of summer, when red peppers are more readily available, and freeze it to use throughout the year. But my reserves were running low, so I bought a whole bunch of red peppers and decided to share this recipe with you. Although bell peppers can be found in a rainbow of colors, the red pepper sauce we will be making today only includes red peppers. 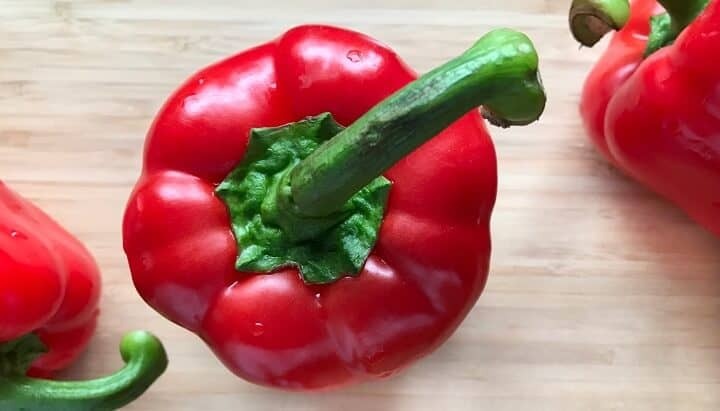 Red peppers are usually harvested when they are fully ripened, meaning that they can spend up to two more weeks in the sun than other-colored peppers. This extra time allows for a color change and a sweeter taste. When purchasing red peppers, choose peppers that are firm, unblemished and glossy looking. The stem end should be green and look fresh. Store red peppers in a plastic bag, in the refrigerator for up to one week. Red peppers have a refreshing crisp texture when eaten raw, dipped in hummus or a yogurt dip or as part of a salad. But that’s not all! Red peppers can also be stuffed with all kinds of mixtures and then baked, and they add texture and color to almost any stir fry. My favorite way to have red peppers is to roast them. The simple process of roasting red peppers intensifies its’ sweetness making it an ideal base for so many other dishes (one of my favorites is this Fregola Salad with Roasted Red Pepper). As I mentioned, I love to make this red pepper sauce in the summer, when local red peppers are available. But after seeing all those beautiful red peppers at the market, I couldn’t help but replenish my reserves of Roasted Red Pepper Sauce! You won’t believe how easily this sauce comes together. 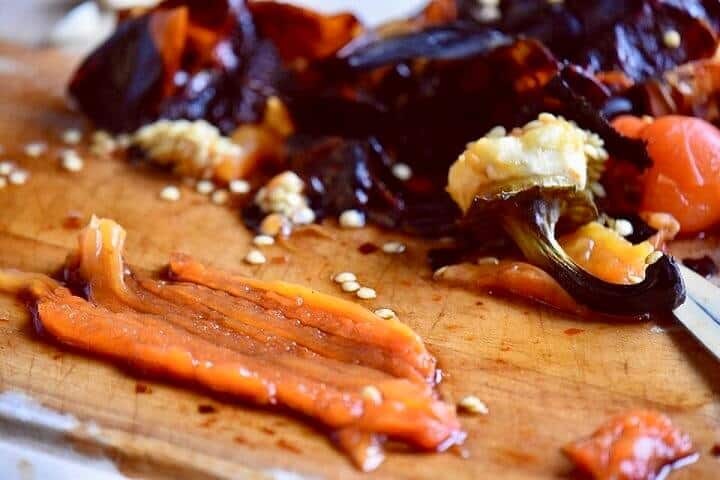 Although there are different methods of roasting red peppers, here is one of my favorite ways. The first thing we are going to do is preheat the oven to 450°F and set the oven grill to the center. Once your peppers have been washed, place them on a baking tray that has been lined with parchment paper. Roast the peppers until the skins are charred, that is to say, black and blistered. Rotate the red peppers every 10 minutes or so in order for all the sides to char equally. This whole roasting process should take about 45 minutes. 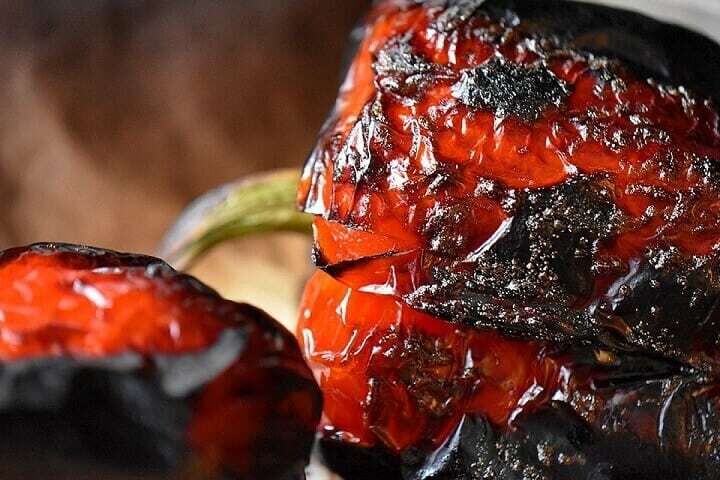 Once removed from the oven, place the peppers in a bowl and cover with plastic wrap. As the red peppers cool down, the steam created will allow for the skins to be easily removed. When removing the skins, DO NOT rinse the peppers as this will remove the roasting flavors. Remove the stems, the seeds and the thick inner membrane. Then, slice into thin strips. You have just made roasted red peppers! AND my favorite: as a red pepper pasta sauce! The timing of when I purchased these red peppers was perfect as I had just made a batch of my homemade cavatelli… that’s what happens when you are snow bound on the week end! These homemade cavatelli are one of my favorite pasta shapes. It is estimated that there are over 200 different pasta shapes with at least three times the number of names as different regions in Italy will refer to the same pasta shape by different names. I’ve included a video of one of my favorite chefs, Gennaro Contaldo, who demonstartes how easily different pasta shapes can be made at home. Did you know that certain pasta sauces are better suited for specific pasta shapes? These are all relatively short pastas, so they carry chunky sauces really well. 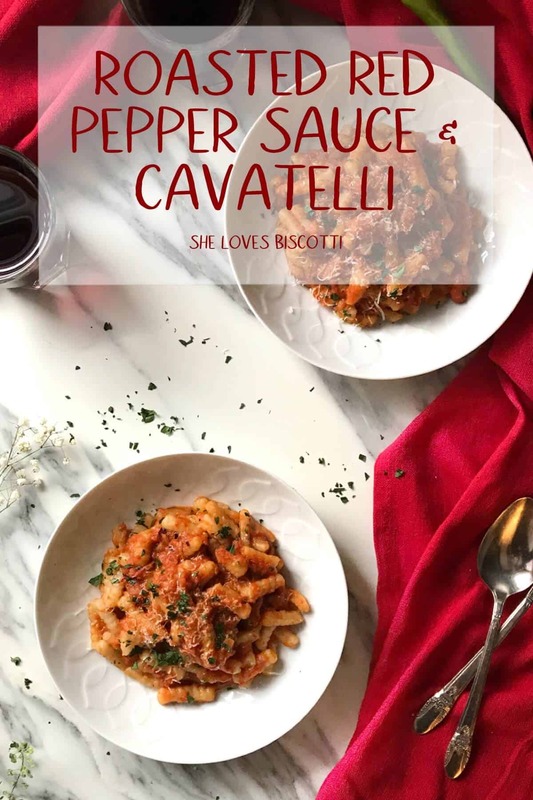 Let me show you how quickly Homemade Cavatelli with roasted red pepper sauce can become one of your favorite pasta dishes! (Just click on the link to see how easy it is to make cavatelli at home with just flour and water). If you don’t have any cavatelli on hand, feel free to substitute any of the pastas listed above, or any other short pasta. In a large skillet, over medium heat, add a few tablespoons of olive oil and sauté one chopped onion. When the onions become translucent, add the garlic and sauté for another minute or so. Add the tomatoes, basil and black pepper and sauté until the tomatoes have started to break down. This should take about 5 minutes. In the meanwhile, get let’s get that pasta going! Since I am boiling homemade cavatelli, my pasta will be ready in less than 5 minutes. By this time, the tomatoes should have broken down nicely. It is time to add the roasted red peppers and sauté for a few minutes. If you prefer a chunky sauce, you can serve it as is. I prefer a less chunky sauce so I will process my roasted red pepper sauce with a hand held immersion blender. Remember, add that pasta water to your sauce until you get the consistency you desire. 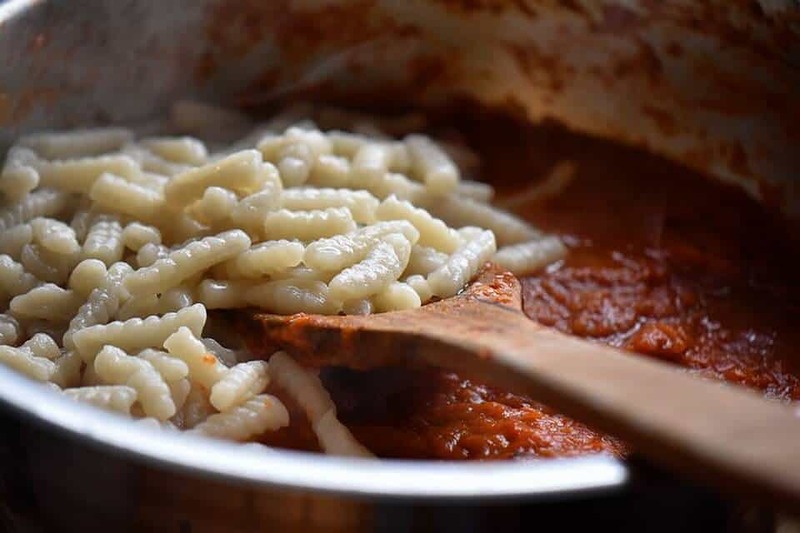 Once your cavatelli pasta is cooked, add it to the roasted red pepper sauce. You’re done! A couple of years ago, I picked up a cookbook called “Sundays at Moosewood Restaurant”. Although I have never visited the famous landmark in Ithaca, New York, I absolutely love this vegetarian cookbook. It highlights different ethnic cuisines, and of course some classic Italian dishes like this roasted red pepper sauce. I have adapted the recipe to suit my family’s preferences. I increased the amount of garlic and reduced the amount of tomatoes. Once you see how easy it is to make your own red pepper sauce, you will be looking for ways to incorporate it in all your dishes!! 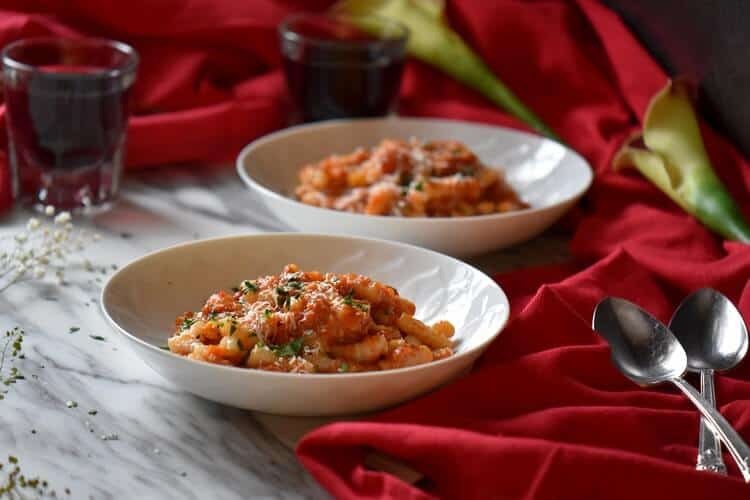 This Roasted Red Pepper Sauce & Cavatelli is just one of the many dishes you can make with this wonderful sauce. Once you see how easy it is to make this Roasted Red Pepper Sauce, buying the jarred version will be a thing of the past. This versatile sauce will contribute both flavor & texture to almost any dish and will quickly become one your favorites! 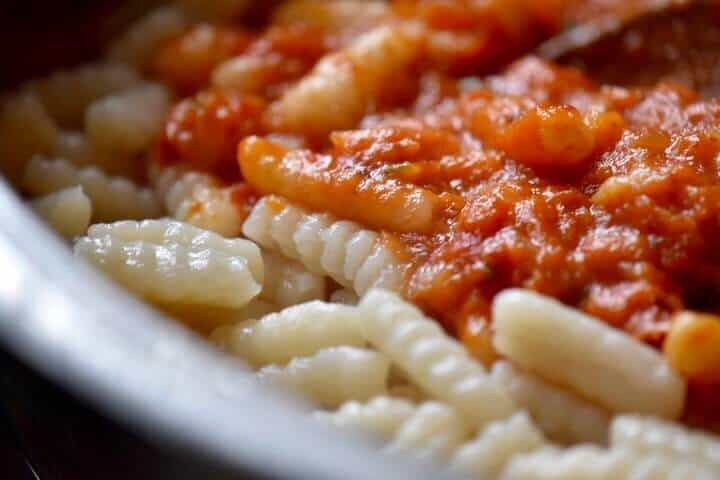 The combination of Roasted Red Pepper Sauce & Cavatelli is a great example. Preheat the oven to 450°F and set the oven grill to the center. Place the whole bell red peppers on a parchment lined baking tray. Roast the peppers until the skins have been charred. Make sure to rotate the peppers every 10 minutes or so allowing all sides to get black and blistered. This usually takes about 45 minutes. Remove from the oven and place in a bowl. Cover with plastic wrap and allow peppers to cool down. Remove the stems, the seeds and the thick inner membrane. Then, simply slice into thin strips.TOTAL YIELD SHOULD BE ABOUT 2 CUPS. Add the minced garlic and saute for about a minute or so. Add the tomatoes, basil and black pepper and saute until the tomatoes have started to break down. This should take about 5 minutes. Add the sliced roasted red peppers and continue to saute. Can leave the sauce chunky or use a food processor to process to desired consistency. Serve with favorite pasta. Garnish with parsley, a drizzle of olive oil and serve. Click on the link for Homemade Cavatelli Pasta Dough Recipe (includes video). There is a roasting time of 45 minutes. Nutritional information provided is only for the roasted red pepper sauce. 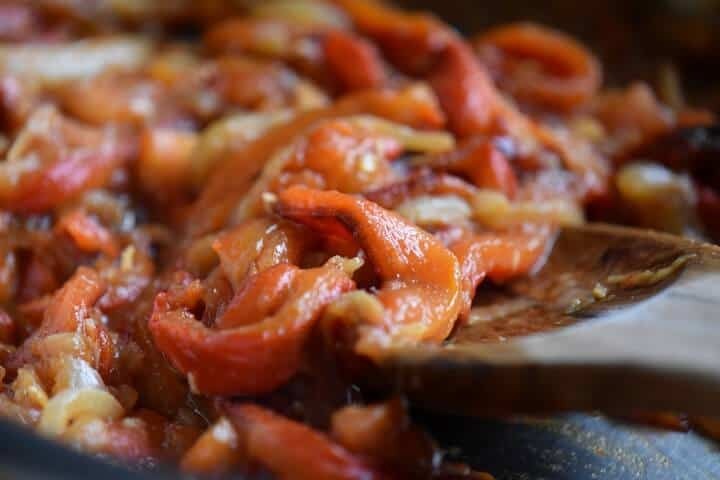 LOVE THIS ROASTED RED PEPPER SAUCE RECIPE? PIN IT TO YOUR PASTA BOARD! I made this tonight for dinner. My family enjoyed it. I never had roasted red pepper sauce. It was delicious. I served it over a gluten free cavatelli pasta I found online. It is called De Puma’s, because my daughter (25) can’t tolerate gluten. It went very well with the sauce. I made your homemade cavatelli this past Easter for 20 people. I did three batches of dough. By the time I did the 3rd batch I got the correct texture, and it looked like yours on your video. My daughter-in-law who is part Italian, was really impressed! Thanks so much for sharing your family recipes. I am thrilled to hear that you and your family enjoyed the sauce. I am always fascinated with the amount of flavor a roasted red pepper has! Wow Mary! That is a lot of cavatelli!!! Thank you so much for sharing your experience with both of these recipes, it means a lot to me ♥ Hope you have a wonderful evening! Yummy! Such a creamy and finger-licking dish which has the potential of becoming my new favorite lunch recipe, Maria! Excellent combination of ingredients. What kind of onion do you use for this dish? Maria, your recipes are always so darn amazing and this is no exception! I love red pepper sauces, so this is certainly going on the list of things to make very soon! Thanks for this detailed, informative post! I feel like I’m learning from the master of Italian cooking! I can think of lots of uses for this flavourful sauce! Thanks. It really is that simple! Cavatelli are also a favorite of mine. I used my little cavatelli board this time around. Thanks for stopping by Diane! Nothing is more comforting to me than the smell of roasting peppers. A jar of roasted peppers was always a staple at our home, but we never combined them with anything but olive oil and garlic with a garnish of basil. You sauce adds a nice complexity to the mix which I look forward to trying soon. 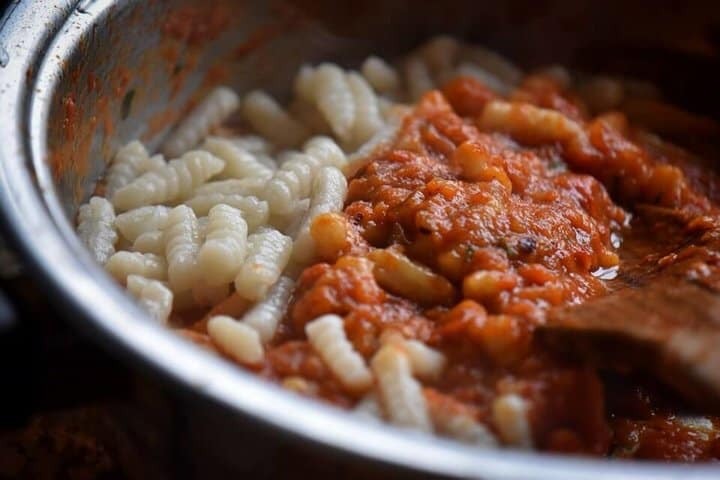 Brava Maria – Your photos are mouth-watering and make me wish I had a bowl of those cavatelli. 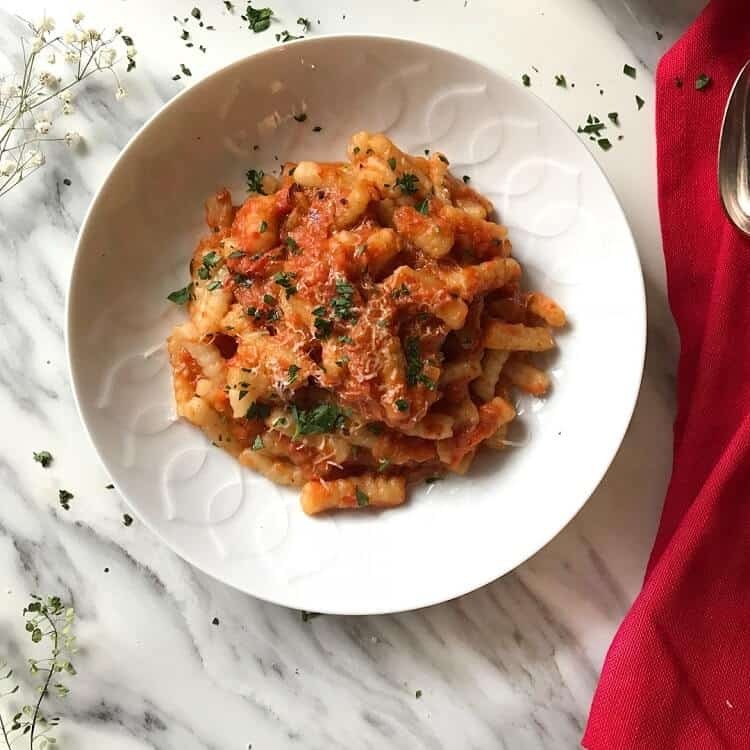 I love roasted red peppers and red pepper sauce and have made both with success, but I have to say when I tried making cavatelli, I totally botched it up and never got the hang of it. I will have to give it another try. Thanks Linda! Too bad we don’t live close to each other… I think we would have fun making cavatelli together!